The two-year Construction Technology program teaches students the essential skills needed to begin a career in the building and construction trades. Through the construction of a new house, students will gain real-world knowledge and hands-on experience in the fundamental components of carpentry, drywall, painting, framing, roofing, floor installation, door and window installation, blueprint reading, siding, electrical wiring, plumbing, proper tool use, and OSHA safety training. Students will develop and demonstrate integrated academics and employability skills through class activities, projects, live clinic, community service and professional development. 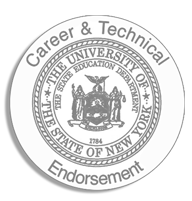 Students are also provided with the opportunity to earn a Career and Technical Endorsement on their diploma by successfully passing an industry-standard technical assessment.